I've tossed the idea around a lot recently about writing a post on the whole bottle vs breast feeding argument but wasn't quite sure how or when to do it! I find there is such a stigma around this whole debate and since becoming a Mum myself I never realised how intense this subject was. Now let me start by saying, I bottle fed my little boy, still am. We trialed a few different forms of formula before finally finding one that suited him and that was that. I went into the whole feeding situation very open minded and when asked by the midwives in my check up's would I be breast feeding, I said yes, I would most definitely be giving it a try. That's as much as I thought about it really, I didn't allow myself to be put under any pressure over this. While I fully understand that breast milk is what's best for baby, I'm also aware that me, my sister, my niece's etc were brought up on formula and there were no issues. I was also aware of the fact that complications may arise, baby might not take to the breast, I might not be able to feed etc, I wasn't going to beat myself up over it. I know there are benefits for mum as well as baby. The one thing I did worry about slightly was colic, I'd heard such horror stories about babies with colic who were on formula. However I have come to realise that while it may be true, formula fed babies may be more prone to colic, I also came to see that breast fed babies could also develop it. While I don't feel I need to justify my reasons for bottle feeding my baby, some people sure as hell try and make you feel like you should! I've encountered the disapproving tone and looks, the somewhat superior attitude of parents who have or are breast feeding, but not one of them would have asked me why I decided not to breast feed, it seems they'd rather assume I just couldn't be bothered or for the convenience etc. For a very short while I would begin to justify why I wasn't breast feeding when I was asked how I was feeding my baby but then stopped myself, there is no need for me to defend my actions on this matter, nor should there be for anyone else. It's an extremely personal choice. I most certainly wouldn't turn around to someone who was breast feeding with disappointment just because it was something I wasn't doing. I would never expect a parent to feel they have to justify their decisions to me on how they feed their baby either. In my own personal experience, I witnessed this "disapproving" attitude in the hospital, from the midwives. Once I'd made my decision to bottle feed, they completely backed off from me for the rest of my time there except for lovely midwife who for the life of me, I can't remember her name but she was one of the very few who didn't make me feel like I was being judged. There are so many different reasons as to why a mother would chose to bottle feed over breast feed and I think much more consideration should be taken when discussing this issue, whether they wish to divulge their reason's or not, there should be as much respect for the mother who bottle feeds her baby as there is for the mother who breast feeds. 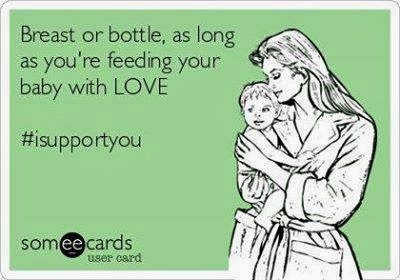 So really, to me, as it says above, I don't care if you bottle or breast feed our baby, as long as you doing what you think is best and with love for your baby and yourself then I fully support you. It is immaterial whether a mother chooses to wash a baby bottle by hand or with the help of a dishwasher; what is important is that they do it quick without wasting time and use the minimum of resources like soap, water and electricity.